Graphene, in its simplest form, is a single layer of carbon atoms arranged in a hexagonal lattice. Alternative forms of graphene (including films, powders, and dispersions) can be fabricated and the properties tuned to potentially enhance a range of products and devices. The word “graphene” refers to a single-layer sheet of hexagonally-arranged carbon atoms. Graphene-based materials are of great interest for Nanotechnology and Nanoscience, especially Nanoelectronics. One million times thinner than paper. One millionth the diameter of a single human hair. Better than silver at conducting. 100 times lighter than aluminum. Made from graphite - think ordinary pencil lead. One carbon atom (0.345 nm) thick. One atom thick layer sheets absorb ~2.3% visible light. Moves electrons 200 times faster than silicon - little interruption. Carries electricity with extremely high efficiency. Impermeable - even helium atoms can’t pass through it. The future applications of the material are potentially enormous. Solar cells rely on semiconductors to absorb sunlight. Semiconductors are made of an element like silicon and have two layers of electrons. Graphene would allow for cells that are exponentially thinner and lighter than those that rely on silicon. Graphene will be used to desalinate saltwater to make it drinkable. Graphene could also be immensely helpful in purifying water of toxins. Seawater passing through precision pores in the graphene lattice allows water molecules through while filtering salt atoms. Graphene can be used as a coating to improve current touch screens for phones and tablets. Graphene has a high carrier mobility and low noise, allowing it to be used as the channel in a field-effect transistor. 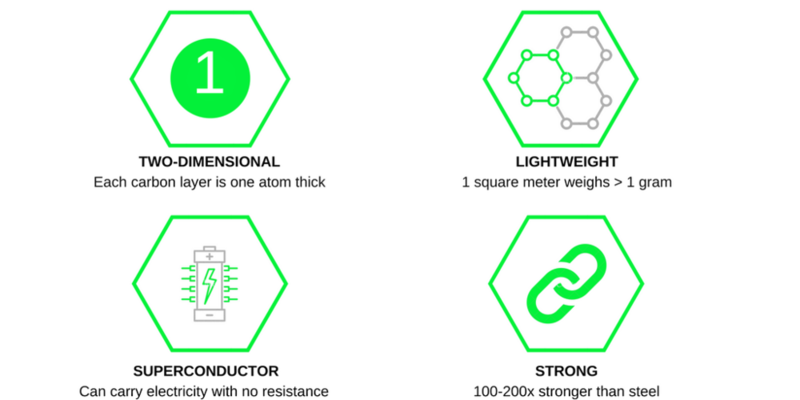 Portable electronics and wearables will both utilize the many properties of graphene in the near future. Graphene will be useful in biomedical research. Small machines and sensors can be made with graphene and are capable of moving easily through the human body, analyzing tissue, and delivering drugs to specific regions. It can also used to monitor various things such as glucose levels, hemoglobin levels, cholesterol, and even DNA sequencing. Graphene is considered a very promising material for use in batteries and supercapacitors. Graphene could dramatically increase the lifespan of a traditional lithium ion battery. It has the ability to conduct heat and electricity which lend to the development of faster battery charges. It can also be used to enhance fuel cells. Graphene-based composites will reduce the weight of automobile and airplane parts, meaning less fuel consumed and GHGs emitted. The conductivity and flexibility of graphene also makes it a promising additive for thermoforming plastics and graphene paints. Graphene technology will reduce waste during the building process and the material can be recycled. Graphene can be applied/sprayed to brick and stone to weatherproof houses. It can be added to food packaging to stop the transfer of water and oxygen molecules, which causes food to spoil. Every atom in graphene is exposed to its environment allowing it to sense changes in its surroundings. Graphene now allows for the creation of micrometer-size sensors capable of detecting individual events on a molecular level. It was originally observed in electron microscopes in 1962, but it was studied only while supported on metal surfaces. The material was later rediscovered, isolated, and characterized in 2004 by Andre Geim and Konstantin Novoselov at the University of Manchester. It is produced by separating a single atom layer film from graphite. This can be done by rubbing a graphite pencil on tape, then sticking together and pulling apart the tape until a single layer of graphite remains (graphene). Other methods to create graphene layers include CVD – Chemical Vapor Deposition. What is the difference between graphene and graphite? Graphene could be described as a single, one atom thick layer of the commonly found mineral graphite; graphite is essentially made up of hundreds of thousands of layers of graphene. Graphene is a carbon nanomaterial with a negligible level of chemical functionality. In contrast, graphene oxide is graphene that has oxygen-containing chemical groups. The chemical functionality of graphene oxide is known to typically reduce the electrical and thermal conductivity of graphene.